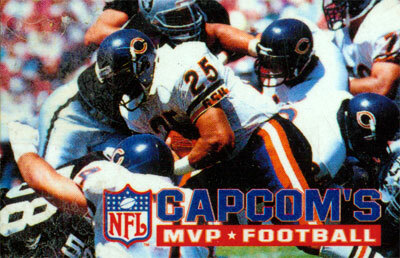 Get out on the gridiron and bust some heads with CAPCOM'S MVP FOOTBALL. Thanks to a full license by the NFL, you'll find 28 real-life NFL teams at your disposal and three modes of play that will challenge your football knowledge and skills. In Team vs. Team mode, you'll go head-to-head against your opponent; in Playoffs mode, you try to take your team to the Super Bowl; and in the MVP mode, you're dared to work your way through increasingly difficult game situations. There are 30 offensive and 25 defensive plays to choose from, meaning you'll always be able to keep your opponent on his toes. So, if you're looking for the next best thing to actually strapping on the pads and taking the field, then CAPCOM'S MVP FOOTBALL is just what you need.